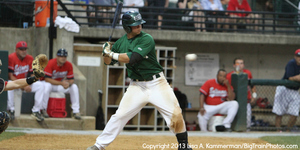 The Big Train now find themselves in a must-win position. The Big Train hosted the Baltimore Redbirds at Povich Field on Thursday in a second round game of the CRCBL League Championship Series. Danny Mooney (Davidson) got the start for the Big Train, and gave up just one earned run over 6.2 innings. The Big Train would get the early lead in the bottom of the fifth, as Tim Yandel (Tulane) came around to score after a single by Kyle Wernicki (Virginia Tech). However, the Redbirds scored three runs to take the lead on a series of strange plays that included a double that was fair by less than a foot and a pop fly that disappeared into the rainy sky. Trevor Charpie (Tennessee) came on to relieve Mooney on the mound. Charpie pitched the last 2.1 innings of the game, giving up no runs on two hits and a walk. With the Big Train trailing by two in the bottom of the ninth, Ryne Willard (Tallahassee CC) cut the lead in half by hitting a lead-off solo home run. However, the Big Train could not complete the comeback and ultimately lost 3-2. The Big Train will host the rival Rockville Express at Povich Field tonight. As each team is carrying one loss, the game will eliminate the loser from contention while keeping the winner alive. Bubba Derby (San Diego State) will take the mound for the Big Train. Derby led the CRCBL in wins, ERA, strikeouts, complete games, shutouts, WHIP, and opponent batting average. The gates will open at 6:00 and first pitch will be at 7:30. Big Train Season Passholders get in free as usual. Tickets can be purchased here or at the gate.